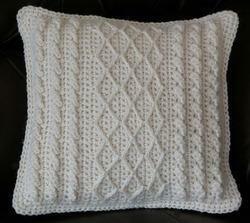 We have splendid collection of Crochet Cushion Cover. We are one of the leading Cushion Cover Manufacturer. Cushion cover is purely handmade. 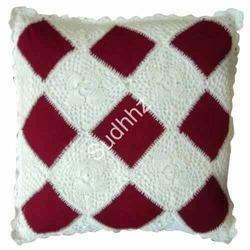 Size will 40 cm square. This beautiful and potent range of aesthetically designed cushion covers is skillfully set in uncommon designs and hues. We make use of bold motifs, geometrical designs and large stitches to decorate and design our cushion covers that sets them apart. We are the Manufacturers, Suppliers and Exporters of Hand made Crocheted Home furnishings, Garments and Laces of all kinds since 1979. Throws, cushions, scarves made of acrylic wool. .